There has been, for many years, discussions, requests, even what could be seen as begging from may of us diagnosed with dementia to use respectful language. That means, respectful from our point of view, not those who are not diagnosed with dementia. Of course, people with dementia do suffer some of the time, but we did before dementia too, but were not then termed as sufferers all the time. Some individuals with dementia may wish to refer to themselves as sufferers, and of course, that is totally their right, but I believe it is not ok to do so publicly, as it infers that we are all ok with that negative label. During the recent ADI2014 conference, it was apparent the language being used by researchers and other presenters to refer to people with dementia is still very derogatory, stigmatising and discriminatory. Now really, do any of these people look like they are suffering, or like they are victims? It looks more to me like we are meaningfully engaged, in the real world, and having fun. I know this to be true, because of course, I was there! People with dementia are learning to live well with dementia, and one of the goals of Dementia Alliance International is to give a voice to, and to empower others with dementia, to live well to. We will publish articles on many of the issues we are facing, written by people with dementia, rather than by those without dementia, who choose to write or speak “about us,without us”. “we are going to die most likely because of dementia but guess what, all the rest of you are going to die too”. “Being diagnosed with dementia is not as much fun as your birthday party, but there is no reason to die now”. “I have been caring for my dad for 7 years now. If people with dementia in early stage prefer to be referred to as “people with dementia” we should respect their wishes because they deserve this from society as well as us, the caregivers. And if they have no preference we should still have the decency to refer to them as such. Yes, my dad is suffering and so am I along with him, I cannot argue with that. But I will absolutely defend people in early stage dementia and absolutely respect their wishes or respect how I reference them because when my dad was diagnosed and still able to function normally it broke my heart that he was treated like he didn’t exist or his opinions didn’t matter and people in our lives began to disappear while his brain was 90% healthy. that’s just cruel and we need to erase that stigma. It’s up to us to do so, not them. I just don’t understand why my fellow caregivers have such a problem with this term and keep up an argument about it (just yesterday it was a big debate in one of the online support groups). Honestly, I am very upset that we as caregivers insist on this stigma for people with dementia who are in early stage. They are not dead yet, they have been diagnosed and doing the best they can to hold on to what they can and live the best they can while they can and they, along with our help can still enjoy life, we should respect that – it’s the least we could do really, before the journey starts getting rough for everyone. We are all exhausted, drained, and our lives have been erased as well but still, I just don’t get it. My guest blog was originally published here on 9 May 2014, and although we’ve been asking for change, we still too often find someone from within an advocacy organisation still refer to us as sufferers, or academics and health care professionals still using offensive terms such as demented or dementing illness. But change is happening, albeit for some of us, still too slowly! Reblogged this on Better Spaces Better Lives. so true Kate and i like that saying and how you respond is all that counts! !Merry christmas too!! Subjective terminology such as assuming a person “suffers” or “loses oneself” or is a “victim” or “afflicted” are terms that are demeaning & derogatory, immediately providing a dehumanising attitude based on “our” personal views. These invalidating terms do not actually reflect the often positive, and wonderful lifestyle that can be attained by a person living with dementia and their families. I am not negating that living with dementia must be formidable and often confronting. 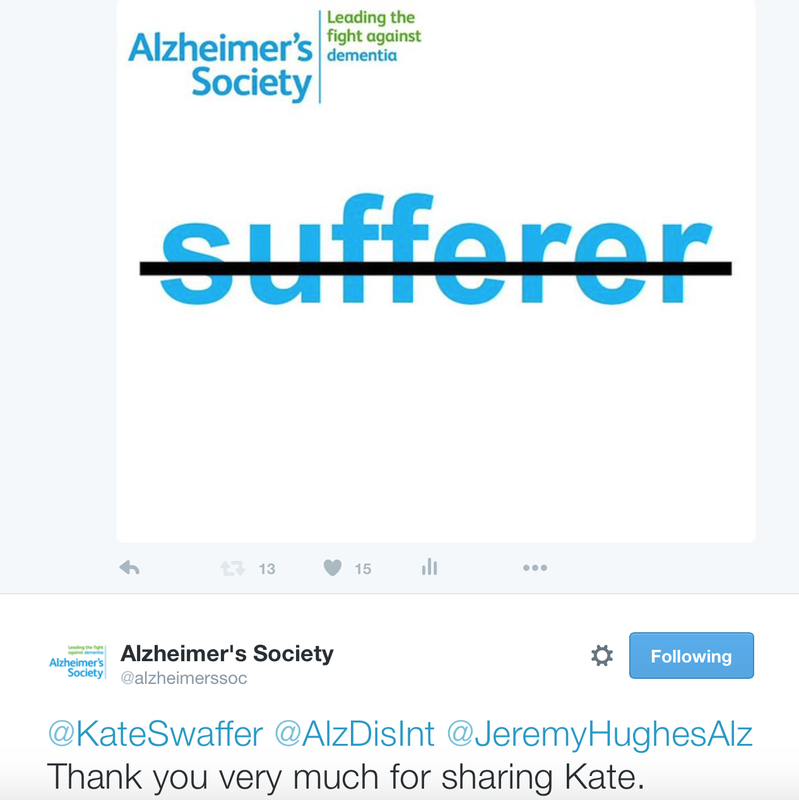 People living with dementia are courageous and inspiring in their fortitude. What I believe is, it is we who are the catalysts to creating the stigma attached to this condition, and the fault lays with us for generating this attitude. Just because living with dementia is viewed as ‘different’ to what we “expect” at this time of life, does not mean we should assume or conclude it is wrong, or to be feared, must cause despair, core suffering or sadness. This is a destructive and harmful myth fostered by constant reinforcement by the media, and/or those that have only received inadequate information. It has unfortunately bred a continuation of ignorance, misunderstanding and misrepresentation throughout most of humanity. Thus fear is born. Hence I again reinforce that these attitudes are frequently the impetus in creating inaccurate perceptions about dementia and those that live with dementia, therefore instilling the harrowing terror & pessimistic mindset, that we then, at times prejudicially pass on to those we care for. Thus if we look at this logically, it is we, as cognitive individuals that create the suffering. Shame on us. Totally – and that is the cruelty of it. That again those that are cognitively aware cause the worst suffering. Hi Kate, I haven’t posted for a long time but still love to listen to what you have to say. As a nurse who cared for people living with Dementia for over 15 years i left the place of my employment over 2 years ago to work in the hospital system. The reason being I became disillusioned with the money making machine and not person centered care. I became frustrated with the language used by the staff towards the residents, eg, speaking down to them like children or playing children’s dvd’s instead of age appropriate material. No matter how much education i provided, the staff still continued on with the incorrect language whether it be music, movies or communication. Why couldn’t they go on the bus trips or the shopping days? Lots of why’s so I left because I could not get my voice heard and could not give the care and respect i wanted to give everyone on my own. Thank you for listening, Cath. It happens too often. One day people will realise. Thanks Kate for your insight.